If, like me, you live in Welllington city, you will have just received your voting papers. Now, call me dumb if you want to, but it is all a little confusing. We’ve got 4 different elections to vote in, of which 3 use the same method, and 1 uses a different method. That’s all do-able – although I’m not sure that everyone will remember to change from 1, 2, 3 to tick, tick, tick, and spoilt ballot papers are just sooo George Bush era that I don’t want to go there. What I am intrigued about though is the absolute lottery of selection. We don’t get junk mail in our letterbox, so I’ve had no individual fliers from candidates. I’ve got no idea what any of these people are really like. There are no suburban fences in the inner city, no front lawns with stakes and placards. My mind, therefore, as regards the election, is as pure as the driven snow on the roof of an Invercargill sports centre. So: the Four Elections. Yes, I have heard of most of the candidates for Mayor – two being complete nonsensical muppets, and out of the four possibles, only two seem to be being taken seriously. Yes, I know Jack Yan has been very clever in starting Lucire up and running it for all these years, but really, a city is a bit more than a Fashion mag, and Wellington deserves the best possible experience and vision at the top. However, let’s put the Mayoral race to one side for a minute, and look at the other Elections running. We’ve got a swathe of possibilities for Lambton Ward, a huge mass of possibilities for the District Health Board, and also a whole pile of candidates for the Greater Wellington Regional Council. I’m almost thinking of missing out or random ticking the votes for DHB and GWRC – my knowledge of them all is next to nothing, except for the tiny blurb that was printed in the booklet next to each person standing. Some of those blurbs are in bullet-point-speak, and for that, they get a bullet from me – no, not a tick, just an ‘ignore’ for their ignorance of proper sentence structure. Some of them are incumbents and familiar names – Judith Aitken for example, seems to be all over the place – and applying for two jobs at once. Sorry – two is too greedy – nothing for you. Make your mind up. But that leaves me with even less people than I knew of before. I can’t believe that the running of a massive part of the budget for one of the most important parts of our economy – the Health budget – is left up to a lottery and complete chance of which particular numpty might get in. If anyone thinks they know anyone who actually IS worth voting for in those elections, please post up your comments. On the down side, we have John Bishop, who supports building better roads – sorry, you just lost my vote there – and Stephanie Cook, who has been a Councillor for the last 15 years – time to move over and give someone else a go, Cookie. And finally Adam Cunningham (meh), and Mark Greening. Much as I like what Greening says, he’s a lawyer, and so gets no vote from me. Odd fish, lawyers. And he says he wants a waterfront for people, not buildings. Boring! I think the current waterfront proves that we only have the people where we do also have some buildings – we’ve been debating that for years. Trying to pick the best three people from amongst that list is a bit of a daunting task. So instead, I’ll just refer you to the Wellingtonista site, where Jo has been quizzing the multitudes of candidates, and even had the temerity to cut off the current Mayor in mid-stream when she exceeded her 25 word answer. Harsh, but fair, but also: we’ll never know what her policies are. So, you see, as boring as this election campaign seems to be, the things those Councillors do does affect us, for years to come. Councillor Danks was right after all. 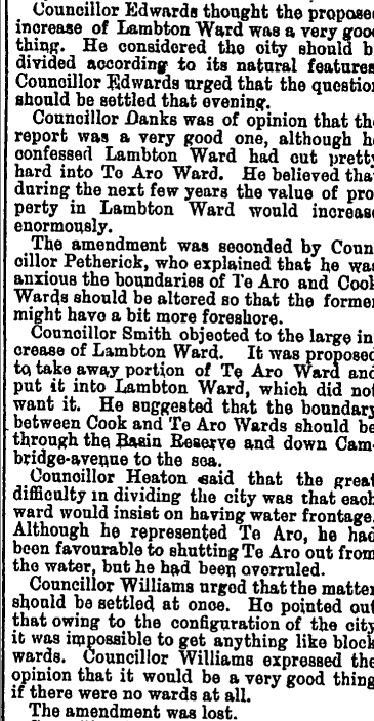 Lambton Ward had cut pretty hard into Te Aro Ward. And yes, the value of property in Lambton Ward has indeed “increased enormously” since then. Decisions made in 1888 still resonate with us 122 years later. So, vote carefully. Vote for people who will look after our city. Yes, I got my election ballot on friday and felt a complete lack of knowledge about what I should select. I have thoughts about the mayoral election, but the rest I’m at a complete loss. Andy Foster is one of the candidates for council where I live – I have pretty positive feelings about him. Is there anywhere to get some insight on the Regional Council options? It seems that these people have a fairly prominent role to play but I never hear much about them. 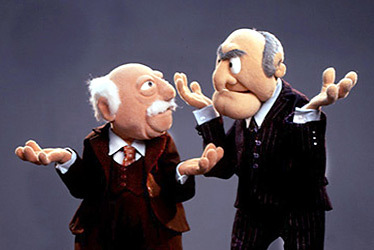 Hey, I don’t think it is fair to call Kerry and Brian, complete nonsensical muppets. Hey Maximus – when I loaded this page in Chrome I got a malware warning saying it contains elements from six.northmecklenburgnews.info. Bit odd since I can’t see any references to that domain in the source code. Nooooo ! Not the virus thingy again. I thought it was long dead. Bother, bother, bother. Its actually really good. Answers a lot of those queries, I think. Why should I care about light rail? There is a frequent bus service through the CBD. Trams would carry more people, but the buses are rarely full so they’d either be emptier or less frequent. Unless the light rail goes to absolutely everywhere buses go then we’ll need a transport spine through the CBD that handles trams, buses, and probably trolley buses. (I hate trolley buses with a vengeance by the way. I have no idea why Wellington persists with the hopeless things and the wires that stop us seeing our buildings and the sky except through an overhead metal filter.) Light rail might be light, but it is still heavier than buses with associated rumbling and vibration. Light rail is a solution looking for a problem. But one that council candidates can talk about without any danger they’ll ever need to actually build a light rail system since their role would be limited to lobbying central government to fund it. Which isn’t going to happen because light rail is all cost and no benefit. If Wellington weren’t growing, and modal share was never going to change, and we didn’t want to better integrate the wider passenger network, then I’d be in agreement with you david. Which candidate are you Erentz? I’m guessing Kris Price. Could you expand on your pro-light rail points? I haven’t marked my ballot yet and you have a chance to convince me to vote for you. For Lambton I’m going McKinnon, Pannett, Ganley – I’ve watched the debates closely and they certainly stand out for me as hard working, enthusiastic candidates with much to offer the city. Secondly I was impressed as they didn’t knock each other at the meetings I attended – we need a council moving forward that works together without so many clashes. Maximus, thanks for including that link to the Sustainable Wellington Transport transport questionnaire results here – I wasn’t actually trying to post a comment on the Fish Fetish post, as you may have realised! For the folks who asked about the Regional Council, plenty of Regional Council candidates responded to our transport questionnaire, and as they have a big say in the region’s transport system, it’s worth checking out what they say. Do you agree with some of the other statements I’ve made? Because light rail is only part of my position, and when you boil it down that is really about having a Council that thinks planning is its core business, and that a comprehensive public transport plan is a good idea. But apparently our Council doesn’t. It just happens that after what is probably approaching something like a thousand hours of reading, analysis, and thought on the subject of transport in Wellington, I’ve concluded (for myself) that light rail will end up forming a core part of such a plan at some phase. So given it is such a huge subject, I’d have to be so arrogant as to think you’re some kind of idiot or fancy myself some kind of magician to assume I could persuade you in just one comment on a blog. But, assuming you’re not anti-PT (because that’s a much bigger discussion we’d need to have! ), would you agree that we should formulate a comprehensive plan for public transport, considering and comparing the options? And you’ll agree that plans are useful because they inform all of our investments. For example, let’s say I’m laying a new water main down Kent Terrace, and nothing says there is going to be a future light rail ROW in this spot following this alignment, so I’m just doing the design to the scope I’m given, and oops, I put it right down what would’ve been the ideal spot for this light rail line. Now through that failure of planning I’ve either: 1) compromised the design of the future transport improvement in that spot, because it has to be rerouted in some less than idea way, or 2) increased the costs of that future transport improvement because it must relocate the water main, or use some kind of construction that will permit maintenance of the watermain without disruption to the transport riding over top of it. That’s just one example, others of course include the massive $11 million spent on Manners Mall (which is what? meter for meter about 150% the cost of the proposed four-lane transmission gully, heck). So if you’re agreeing with me so far then you’ll agree not planning for things like this is an unecessary failure of our Council that makes things more difficult and expensive downtrack. Anyone considering voting McKinnon, Pannett, Ganley (like Bella) should put Ganley number 1. Mckinnon and Pannet are going to get in. Third place is the real race. Giving Ganley a 3rd preference could let ACToid John Bishop or Pubman Cunningham through. It’s important to remember that STV doesn’t give you three votes, just one that can transfer if your 1st preference doesn’t make it. Well, you’ve got my vote! That certainly sounded completely logical, and much the same as I have been thinking / saying. Kris Price with a 1 from me. Richard, I’m still intrigued by the push for Marcus Ganley. Some girlfriends of mine have been saying they’d vote for him because he’s dishy, but I don’t think that cuteness should be a voting strategy for anyone except Justin Bieber. And besides, those thickj Phillip Sherry glasses are just sooo 1963. But what does put me off him is that he’s a political man – a Goff-ite – or acolyte – which is an unnecessary muddying of the waters in the NZ local Gov system. One of the things I like about the NZ local Gov scene is that it is not heavily politicised in the same manner that Central Gov is – yes, Kerry is probably a Tory (she’s certainly not a Green), but it is not like we have a Tory Council, like Wandsworth and Westminster were in the UK. That strong sort of politicisation just screwed up the whole country. But yes, anything than John Bishop – that just leaves me cold. Like a dead fish. Richard, For me I will still be going McKinnon, Pannett, Ganley – I’m not going to risk tactical voting – it may not work and I’d rather have McKinnon and Pannett with Ganley missing out than McKinnon or Pannett missing out and others getting in. Erentz/Kris… I’ve ranked you highly. I don’t agree with everything you say, but some of that is a difference in timing. I don’t see the point of worrying about things that we may need to do in 30 years when there are plenty of immediate issues that need addressing. BUT… You’re here which proves that you have a passion for Wellington, and you’ve always posted coherently and in good humour and that is worth something. I hope you do well. On the other hand, I hope that the Ritchie woman who patronised us last month does badly. I wouldn’t have bothered voting at all in the DHB election since I intend to be completely healthy for the next few years. Except I was forced to participate in order to rank all the other candidates before her. I’m all for independents in local government. I can’t for the life of me see why I’d vote for someone whose priorities are 1) Phil Goff; 2) the Labour Party; and 3) Wellington. Local government requires pragmatism and an attention to detail rather than ideology. I also don’t like the idea of party machines with their large budgets (and ability to indulge in electoral fraud as we’re seeing in Auckland at the moment) crowding out genuine independents like Kris. Over at the Sustainable Wellington Transport blog, we’ve now put up a guide to voting tactically in the local body elections, to boost the chances of candidates you like and hinder the chances of candidates you don’t. It’s worth checking out if you haven’t voted yet. Richard, I�m still intrigued by the push for Marcus Ganley. Some girlfriends of mine have been saying they�d vote for him because he�s dishy, but I don�t think that cuteness should be a voting strategy for anyone except Justin Bieber. … But what does put me off him is that he�s a political man � a Goff-ite � or acolyte � which is an unnecessary muddying of the waters in the NZ local Gov system. Well anyone who’s going to be effective needs to be a political man I guess, Cook, Ritchie, Goulden (I’ll stop now) demonstrate how the politically unsavvy ones can’t make a positive difference. Ganley’s has the political smarts to actually achieve the things that KrisP talks about. He’s also worked for Cullen and Tamahere so there should be some fiscal prudence alongside the progressive streak. Ganley is the hottest Lambton candidate. He’s definitely got the dishy vote cornered. DavidP have you looked at http://marcusganley.org.nz???? When you say 1) Phil Goff; 2) the Labour Party; and 3) Wellington what’s your basis??? looks more like 3, 2, someotherstuff, someotherstuffagain, and maybe some third time stuff before 1?